This six-part TV miniseries is an adaptation of the successful 1963 play by Alan Hopgood, first staged by the Union Theatre Repertory Company (now the Melbourne Theatre Company). The story follows the misadventures of a new recruit to the East Melbourne Galahs football team. The Galahs have held the "wooden spoon" (i.e. they have never won a first-division premiership) for the past seventy years but this year they look set to finally beat arch-rivals The Dingoes to the Premiership. Their secret weapon is farm boy Achilles Jones (Hargreaves) from the country town of Manangatang. None too bright, but blessed with exceptional physical prowess, Achilles is plucked from obscurity to play first-division Australian Rules football and give the Galahs a shot at the top spot. Jones can kick a sack of wheat ten yards in his bare feet -- but there's a complication -- the champion recruit has never seen a game of football in his life. Helping Achilles along are the club's over-ambitious manager, J.J. Forbes, the verbose, "in your face" boundary rider Wobbly Coates, the faithful and long-suffering footy widow, Lil, and the club's loyal 'gofer', Wally Sloss. It’s interesting to note that the storyline and setting are remarkably similar to that of David Williamson’s celebrated 1976 play The Club, which was filmed by Tim Burstall and which also co-starred Frank Wilson. The play, Hopgood's first sage success as a writer, remains very popular and has lost little of its relevance -- indeed, one recent planned production stalled because of resistance from football clubs -- and is still regularly staged by schools, dramatic societies and theatre companies. The TV cast was very strong indeed, featuring many veteran performers. 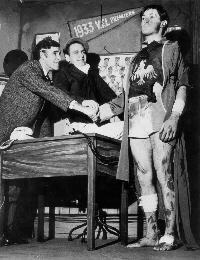 Dennis Miller (who played the part of Achilles in the original 1963 MTC production), Maurie Miller, Fields and Hopgood (who also wrote the screenplay for Alvin Purple) were all current stars of Bellbird; Wilson was a Crawfords regular and a star of Division 4; Evans was a well-known character player who featured in countless local TV productions; McEwan had been a cast member of Adventure Island; Mallaby was a star of Homicide; Diane Craig appeared in many programs and is the wife of actor-comedian Garry McDonald. Hargreaves, one of the best and most popular Aussie actors of his generation, went on to star in Aussie film classics including Don's Party and Malcolm, among many other achievements, before his untimely death from AIDS in 1996. Hopgood later starred in Prisoner and Neighbours. One episode of the series was recently (Sept 2003) screened as part of the 'Melbourne On Screen' series at the Australian Centre for the Moving Image. It would therefore appear liekly A sequel, And Here Come Bucknuckle, was made in 1981.